What is probate of an estate in Michigan, and how long does it take to complete? Probate is the court-supervised legal process that may be necessary to transfer a person’s property when he dies. It enables a family member to gather the person’s assets, pay his taxes and debts, and distribute the assets to his heirs. In some cases, the probate will involve distributing the deceased person’s property pursuant to his will. If he died leaving no will, his assets would be distributed to his heirs according to Michigan probate laws. Affidavit. If the deceased person’s assets are $22,000 or less and do not include real estate, the heirs may be able to file an affidavit with the probate court that allows assets—such as bank accounts—to be transferred to the surviving spouse or heirs. Once the affidavit is filed, the person can present the affidavit and death certificate to the financial institution to have the assets transferred to him. Estate under $22,000. If the real estate and other property are worth $22,000 or less, the surviving spouse or heirs can file a petition with the probate court and pay the filing and inventory fees. The court will enter an order requiring the funeral and burial expenses to be paid or reimbursed, along with the transfer of the property to the surviving spouse or heirs, without the need for the appointment of a personal representative or court hearing. Unsupervised informal probate. An unsupervised informal probate allows the personal representative of the estate to proceed with limited court supervision. While documents will need to be filed with the court and provided to the heirs, fewer court hearings will be required and may only be necessary to resolve disputes. Supervised formal probate. 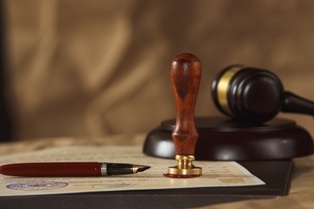 A supervised formal probate is a lengthier probate of an estate that requires court supervision of many of the estate’s actions, such as the appointment of the personal representative, the sale of real estate and other assets, an inventory of the assets of the estate, and the final distribution to the heirs. It is utilized in complicated probates and where there are major disputes between heirs. The length of time that it will take to complete the probate of an estate will depend on many factors. If the estate is valued under $22,000, the process can be completed fairly quickly. For unsupervised and supervised probates, the process of probating the estate will generally take at least seven months to complete. Many factors can extend this time period. These can include the size of the estate, length of time it takes to locate a will, personal representative, or heirs, disputes with creditors, and will contests. In some cases, complexities in the administration of the estate or disputes can result in it taking years to complete probate. Do you need to probate a family member’s estate? Our experienced probate attorneys are here to guide you through the process so that it goes as smoothly and quickly as possible. To get your questions answered and learn more about the best way to proceed, contact our office to schedule your free consultation.